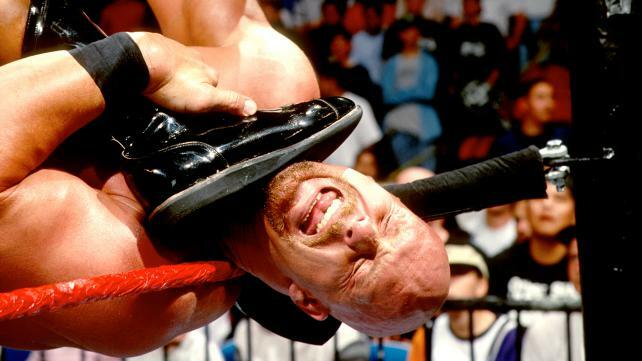 The Rock and “Stone Cold” Steve Austin have one of the most storied rivalries in WWE history. They battled over both the Intercontinental and WWE Championships and are two of the most popular Superstars of all time. In 1998, Austin won the Royal Rumble Match and punched his ticket to a WWE Title Match against then-champion Shawn Michaels. The week before The Show of Shows, to keep his match with HBK a title match, Austin had to face Intercontinental Champion The Rock. Foreshadowing their legendary encounters at future WrestleManias, The Rattlesnake and The Great One battled in and out of the ring as Austin had to also fend off The Nation at ringside. The Rock maintained a great deal of momentum, but “Stone Cold” managed to take him down with a Stunner and secure the victory, sending a clear message to HBK for WrestleMania.